The Graduate Center for Excellence, centrally located on the third floor of the Blume Library, is a collaborative learning space designed exclusively for St. Mary’s masters and doctoral students to collaborate with classmates and students from other disciplines. Its collaborative learning stations offer dry erase table surfaces and the capacity for students to display their computer device on TV monitors via HDMI cables and Apple TVs. The Graduate Center coordinates programming to support graduate student success, including orientation, seminars to support research and writing, and peer mentoring. 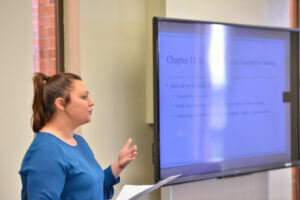 The space was created by funding from a Title V Promoting Postbaccalaureate Opportunities for Hispanic Americans (PPOHA) grant and has become a desirable place for both individual and group study. The Graduate Center for Excellence follows the hours of the Blume Library for the second and third floors. Graduate Student Success Seminars offer a series of engaging seminars designed to support graduate students with a focus on research and writing support. Seminars are taught by faculty and held in the Graduate Center for Excellence. Seminars are broadcast via webinar and recorded for asynchronous viewing. All graduate-level students from the Greehey School of Business, the College of Arts, Humanities and Social Sciences, and the School of Science, Engineering and Technology, as well as Master of Jurisprudence students from the School of Law, are invited to participate. Space is limited and registration is required. Click here for details on upcoming seminars (Gateway login required).